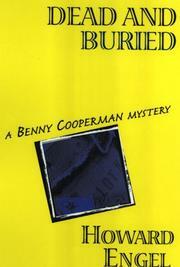 When feckless Benny Cooperman, the only Jewish private eye in Grantham, Ontario, agrees to investigate the purportedly accidental death of Jack Dowden, a trucker for Kinross Disposals, at the request of his widow, he finds irregularities in the inquest testimony; a suspiciously fortuitous arrival of the company doctor at the moment of death; and hints of illegal dumping of PCBs by Kinross and its parent company, Phidias Manufacturing. Environmental Front leader Alexander Pastor fills Benny in on the companies’ scams, and their ties to City Hall Director of Sanitation Paul Renner. But it’s Teddy Forbes, ex-wife of Phidias CEO Ross Forbes, who thanks Benny for helping her win a divorce by providing him entry to the well-guarded company, as well as background on alcoholic Ross, his autocratic father, the Commander, and his soon-to-be son-in-law Norman Caine, the new head of Kinross. What next? Alexander’s body turns up alongside toxic matter hidden deep in the bowels of the Fort Mississuaga site being handled by Mafia-tinged Sangallo Restorations. And the Commander misses the rehearsal dinner of Caine and Forbes’s daughter because he’s lying dead in the country club sauna while his wife, Miss Biddy, suffers a stroke. Meantime, Benny keeps turning up specimens of Hesperis matronalis, a plant also known as Dame’s Rocket, in suspicious places. Undeterred by too many clues, cover-ups, and family treacheries, Benny gathers his gal pal Anna and his cop buddies and explains it all with the aplomb of a Golden Age detective. Tricky but stodgy, with less of Benny’s self-effacing charm than usual, and an all-too-brief cameo appearance for his smart-mouthed mom.